Celebrities are THE fashion icons for beauty, makeup — and of course, hairstyles. Kelly Clarkson is no exception. That’s why we’ve got Kelly Clarkson photo galleries, pictures, and general beauty news on this celeb. Her style is totally inspiring and worth checking out. So if you’re searching for some beauty tips, hairstyle options, and fashion advice, turn to Kelly Clarkson. She’ll bring your fashion to a whole new place. 1. Right when you get out of the shower, apply a generous amount of volumizing mousse to towel-dried hair. 2. Flip your hair over and blow dry roughly with your hands for a few minutes to add volume. 3. Switch to a round brush and finish drying your hair, making sure to lift hair up and out. 4. Use a 1-inch curling iron to curl the ends of your bob for a more haphazard feel. Mist all over with strong-hold hairspray to finish. 1. Comb a volumizing mousse through damp (not soaking wet) hair. 2. Blow dry hair with a round brush, lifting at the roots to add volume. 3. When hair is dry, spray 2-inch sections with a curl-enhancing spray that offers soft hold. Then wrap each section around a large-barreled curling iron, curling away from the face for that Farrah Fawcett/"Charlie's Angels" look. 4. Finger-comb curls to separate, then spray with a light-hold hairspray. 1. To get Ke$ha's hairstyle, apply a volumizing mousse to damp hair and part in the center. 2. Then, blow dry evenly using a large round brush. As you blow dry, hold each section around the brush for ten seconds and set with a cool shot. 3. Finish by misting hair with a flexible-hold hairspray. 1. To get Ke$ha's hairstyle, apply a frizz-taming serum to damp hair and blow dry using a round brush and lifting at your roots. 2. Once your hair is dry, mist a root-lifting spray onto your roots for added volume. Use your fingers to sift your roots as you go. 3. Run a flat iron throughout your hair to tame any flyaways and smooth out your bangs. 4. Finish with a flexible-hold hairspray. 1. To get Ke$ha’s hairstyle, apply a volumizing cream to damp hair and blow dry with a round brush, lifting at the roots for maximum volume. 2. Create a deep side part using the arch of your left eyebrow as a placement guide. 3. Apply a heat protectant and roll wide sections of hair into a large hot rollers and secure. Let the rollers sit for 25 minutes. 4. Remove rollers and use bobby pins to secure the left side of your hair tightly behind your left ear. 5. Finish by misting a strong hold hairspray throughout. 1. To get Ke$ha's hairstyle, apply a heat protectant to damp hair and blow dry using a round brush. Lift at the roots for volume. 2. Create a middle part, then wrap sections of your hair around a styling wand. Mist each section with hairspray before wrapping, and hold for a few moments before releasing. 3.Spritz a texturizing spray throughout your hair, then rake through your waves with your fingers to create a messy, tousled look. 4.Finish with a medium-hold hairspray. 1. To get Ke$ha's hairstyle, part your hair down the center to start. Run a generous amount of thickening mousse through your hair from root to tip. 2. Separate your hair into four sections. Braid a few sections, and twist the other sections. Secure all of your hair into a bun at the top of your hair, and let it dry naturally. 3. Once your hair is dry, take out the braids and twists and run your fingers through your hair. Mist your waves with salt spray, and scrunch them with your hands. 1. To get Ke$ha's hairstyle, apply wave-enhancing cream to damp hair, and blow dry using a diffuser to bring out your natural waves. 2. Once your hair is completely dry, wrap small sections of hair around a 1-inch curling iron to touch up your waves. 3. Mist all over with texturizing spray, and tousle your hair with your hands. 1. 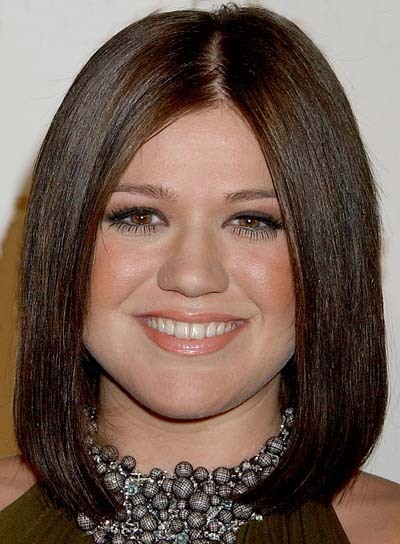 To get Kelly Clarkson's hairstyle, apply a volumizing mousse to damp hair, and then blow dry evenly using a round brush. 2. Create a deep side part, then mist your hair with a heat protectant spray. 3. Curl 2-inch sections of your hair using a large barrel curling iron, curling hair away from your face.